Senenmut had a humble background (his family (Ramose and Hatnefer) came from Armant), he was to become under Hatshepsut's reign one of the most powerful men in the country. There is speculation as to whether this was down to Senenmut's own natural talents as an administrator that caused this rise to power - or was there a close personal relationship between the King and her subject? 'Spokesman for King Hatshepsut, Steward of the royal family, Superintendent of the buildings of the god Amun'. Despite the claims of a love affair between Hatshepsut and Senenmut, it is clear that Senenmut was a man with some talent at his job - he had supervised the transport and erection of the obelisks at the temple of Amun-Re at Karnak, he supervised the building of Hatshepsut's mortuary temple at Deir el-Bahri. It is clear from the statues found of Senenmut, that he enjoyed a very close relationship with Neferure - the daughter of Hatshepsut (it is possible that this is the only sort of relationship he had with the King Hatshepsut, as teacher to her daughter. 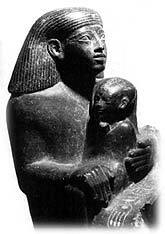 Although the converse may be argued - that Senenmut educated Neferure because of his relationship with Hatshepsut). For some reason, towards the last quarter of Hatshepsut's reign, Senenmut fell from favour and disappears from view (sometime between Year 16 to Year 19 Hatshepsut). There are theories - Neferure (Hatshepsut's daughter) died in Year 11, after her death Senenmut seeks to join with Tuthmosis III. However, Senenmut was a strong supporter of Hatshepsut, once Senenmut died / disappeared Hatshepsut herself soon lost the throne. It is certain, however, that he was never buried in either of his two tombs (see below). was he killed abroad, drowned in the Nile, had a lovers' spate with Hatshepsut who then had him killed, agents of Tuthmosis III had him killed... and so on. 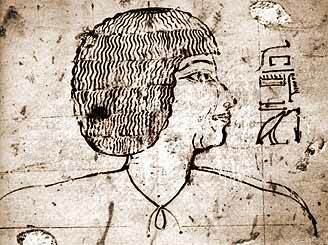 Many of Senenmut's images and monuments were attacked and vandalised after his death - but by whom? Hatshepsut or Tuthmosis III? He built two tombs for his burial - the first he constructed at Sheikh Abd el-Qurna (TT71), this tomb still holds a block statue of Senenmut holding Neferura on his lap. Also found in the tomb were 150 Ostraca (these included sketch plans of the tomb, calculations, various reports and also various literary texts which included: 'The Satire of the Trades, The Tale of Sinuhe and the Instruction of Ammenemes I). The second tomb he built to the east of the first court of the temple of Hatshepsut, this tomb was bigger and better than the first (TT353) - the entrance was cut just to the north of Hatshepsut's Deir el-Bahri mortuary temple, Senenmut's tomb had a long and winding passageway so that the chamber was located underneath the outer court of the temple. This tomb was never completed and the images of Senenmut in it were defaced in antiquity.